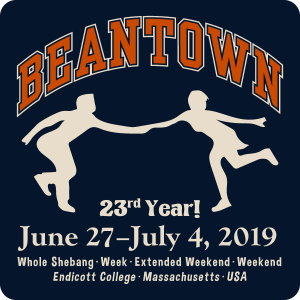 This will be the 23rd year for Beantown Lindy Hop Camp and we are pleased to be back for the 15th time on the beautiful Endicott College campus in Beverly, MA. Camp will be running from Thursday, June 27 to Thursday, July 4, 2019 with several registration options to choose from including: Whole Shebang , Week , Extended Weekend and Weekend . Lindy Hop classes will be offered in tracks as well as many optionals to choose from, including Mini-Tracks for specialty topics, and much more. This year’s camp will feature a fabulous teacher line-up, live music, competitions and many fun activities. Join us in our 23rd year—you’ll have a blast! Check the Beantown Camp site for full information!